The debate over cultural appropriation, its freedoms and limits is nothing new, but the response to it is changing, now that collective voices can find common ground on social media. A painter's work is equated to "cultural genocide" after she's accused of appropriating elements from Indigenous styles — she says she was merely inspired. A group's costumes for the upcoming Toronto Caribbean Festival include a headdress meant to pay "homage" to Canada's 150th anniversary — but some Indigenous communities are outraged. The debate over cultural appropriation is ongoing, but the response to it is changing, now that collective voices can find common ground on social media. The latest controversy to spark an outcry online: An editorial written in an obscure literary publication that most people have never read. A few tweets later, it has not only revived a conversation about appropriation, but has also led to the editor's resignation and a series of contentious posts from media heads. A column written by Hal Niedzviecki that appeared in the latest issue of Write magazine, a quarterly publication from the Writers' Union of Canada, suggested "anyone, anywhere, should be encouraged to imagine other peoples, other cultures, other identities," and stated that the author didn't "believe in cultural appropriation." It appeared near the beginning of an issue dedicated to Indigenous writing. Niedzviecki, who has since resigned as editor, acknowledged that Canadian literary subject matter and writers are "exhaustingly white and middle class." But rather than calling on minority voices to fill the void, he instead encouraged those same writers to "write what you don't know" and "relentlessly explore the lives of people who aren't like you." He also called for an "Appropriation Prize" in literature, saying "there's nothing preventing us from incorporating a culture's myths, legends, oral histories and sacred practices into our own words." The Writers' Union of Canada later apologized for the opinion article, which was pulled from its website following immediate uproar online. It can be seen below. 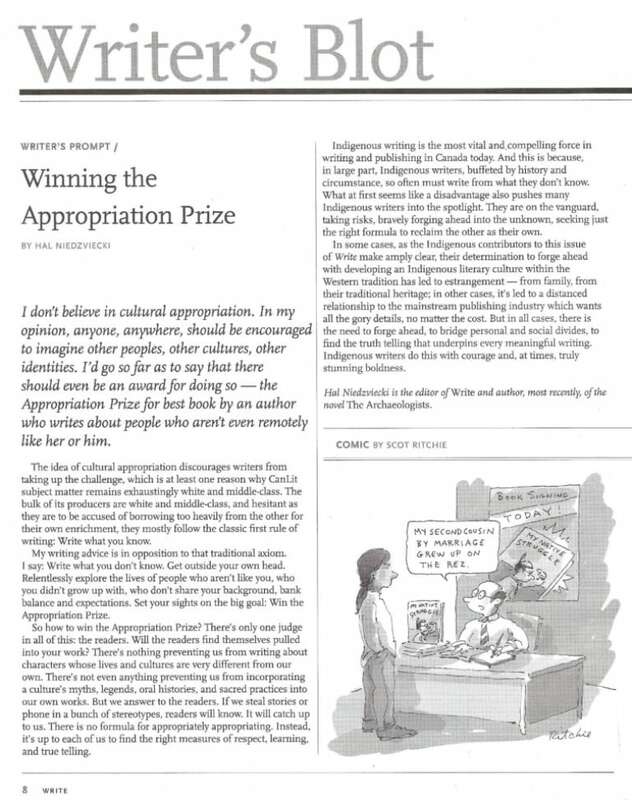 A scan of Hal Niedzviecki's editorial from the May 2017 issue of Write magazine from the Writers' Union of Canada, in which he says he doesn't believe in cultural appropriation. Alicia Elliott, an Indigenous writer of the Tuscarora people, was one of the first to call out the magazine. She contributed to the same issue and her story, which discussed the harmful effects of cultural appropriation, was edited by Niedzviecki. 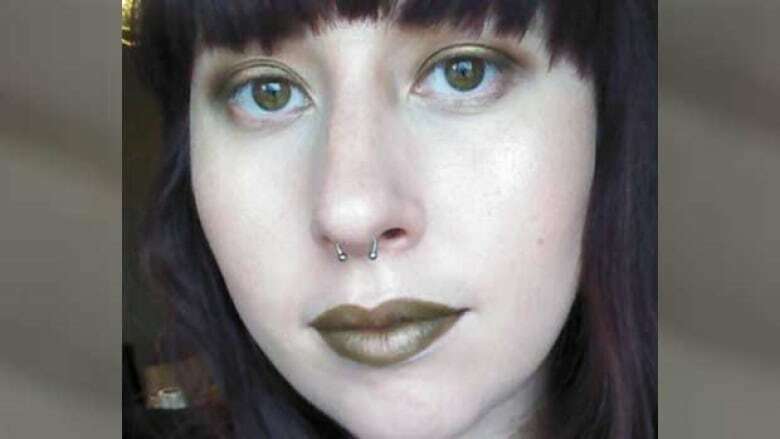 "At first I thought it was a joke," she told CBC News, referring to the editor's opinion piece. "I thought maybe it was going to be a satirical article." As she read further, she found it "very, very frustrating." "He has more power than we do in this situation. So it just seems like he just wasn't concerned at all about that power differential, about the way that he was positioned as a white man talking about cultural appropriation which he himself, as far as I know, has not ever experienced." But the debate quickly moved in a different direction online when prominent leaders in media, including former Rogers executive Ken Whyte, National Post editor in chief Anne Marie Owens and CBC managing editor Steven Ladurantaye, began offering up money to support the so-called appropriation prize mentioned in the op-ed. It was quickly pointed out on Twitter that all of the decision-makers, one of whom argued they were fighting for "freedom of thought and expression," were white, further illustrating the lack of understanding when it comes to issues of appropriation and inclusion. Owens and Ladurantaye later apologized for participating. A meeting has been organized with CBC management and the newsroom's inclusion committee. "They're making jokes about how 'let's put in $500,' 'Let's put in $1000 for this appropriation prize,'" said Elliott. "That's my rent every month." Jesse Wente, a CBC columnist and Indigenous advocate, said he's not suggesting artists can't use their imagination to conceive of new worlds, but it doesn't mean "you can create without critique." "My issue ultimately with the original column was that it called for the 'overclass,' for white writers, to imagine," Wente told CBC News Network's Carole MacNeil during a panel discussion Saturday. "It didn't actually call for the elevation of actual Indigenous voices. That is actual inclusion. The other is appropriation." Jonathan Kay, editor-in-chief of The Walrus and also part of the panel, criticized the way Niedzviecki's resignation was handled, arguing he was treated "as a sort of hate criminal." "There is a legitimate debate to be had about where the rights of artists to imagine other cultures end, and the rights of those other cultures to avoid appropriation begin," said Kay. "And it doesn't help the debate when you take one side and cast them all as a bunch of racists." The social media calls by heads of respected news outlets for an appropriation prize showcase "a media that is woefully lacking in inclusion" and that "is ill-prepared to actually have the debates," Wente said. "The reality is, this is the new reality," said Wente. "When these issues come up, they will be called out repeatedly and vociferously." The issue goes well beyond an isolated incident, according to Eve Haque, director of York University's graduate program in social and political thought. "We're in this moment where there's this incredible fear around a particular kind of cultural politics," she said. "The larger fear is that 'oh my god, my right to do X is going to be restricted.' What matters is who's worried about their rights and what are the fears that they are mobilizing and then reacting to." Haque says the battling viewpoints online are part of "culture wars" happening across North America: One side defending freedom of expression and the other trying to show concrete examples of how those freedoms can also hurt people and communities. Elliott suggests a litmus test for artists when it comes to incorporating other cultures into their own work. "You always have to be asking yourself, 'Why? Why is this the story that I need to tell?" she said. "If you're building relationships with the groups or with the people that you're writing about, then there's not going to be any outrage." 'It's not like people want to be angry all the time," she added. "It's really, really tiring."